“Phoenix Wright: Ace Attorney — Dual Destinies” (Capcom), the latest title the long-running “Ace Attorney” franchise for the Nintendo 3DS, explores conflicting legal moralities in a way mature gamers are likely to appreciate. Unfortunately, adult content keeps this new iteration from being an age-appropriate experience for most youngsters. Within the animated world portrayed here, the legal profession is entering an era known as “the dark age of the law.” The idea that lawyers should work to deliver a favorable verdict for their firm by whatever means necessary has begun to predominate. Thus the notion that the ends justify the means is prevailing over the more traditional principle that the truth must be pursued for its own sake. Championing the latter point of view is the protagonist’s law partnership. “The Wright Anything Agency” is peopled by a collection of likable characters dedicated to discovering the facts. 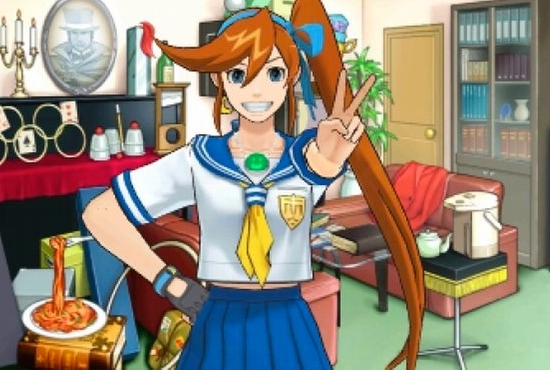 Besides Phoenix, other playable personas include Athena Cykes — a nervous new attorney with an expertise in psychology — as well as longtime star of the series Apollo Justice. With a name like that, how can he go wrong? The majority of the gameplay consists of examining crime scenes, talking to witnesses and, of course, engaging in courtroom dramatics — including cries of “Objection!” and “Hold it!” The whole thing is radically over-the-top with outrageous plots and such characters as Ted Tonate, the bomb expert, and the ominous Simon Blackquill — a prosecutor currently serving time for murder who threatens witnesses with death should they fail to be truthful. While its premise may initially sound dull, the mix of eccentric personalities, suspense and great storylines on offer here make this a game to which players will be increasingly happy to devote their time. Gamers seeking a realistic experience should look elsewhere, however. With characters using such devices as a “Mood Matrix” that allows them to analyze witnesses’ emotions, we’re well into the realm of pure fantasy. Silly technology notwithstanding, there is a serious message underlying the action: the irreducible importance of truth. The narrative pulls no punches concerning which side is in the right, an assessment fully in line with Catholic teaching. While the elements listed below would normally exclude all but grown-up players, the ethical strengths and formative value of “Dual Destinies” may make it acceptable for at least some older adolescents. The game contains occasional scenes of bloody cartoon violence and a few instances of crude language. The Catholic News Service classification is A-III — adults. The Entertainment Software Rating Board rating is M — Mature. Shaw reviews video games for Catholic News Service.